There is something so comforting about a traditional British chicken pie with memories of school days and family lunches. Like its close cousin, Steak and Kidney Pie, British Chicken Pie is part of the fabric of British food. 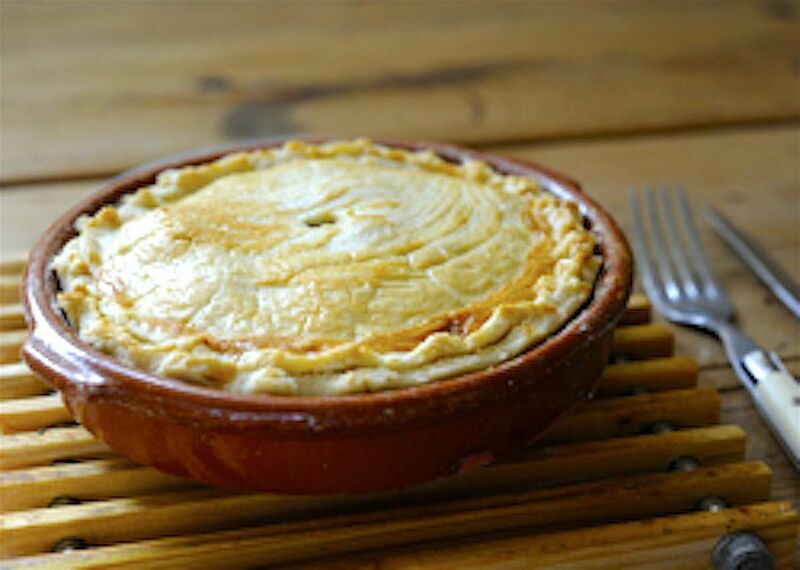 This chicken pie recipe is easy to make, and in a hurry, you can use ready-made pastry. Using meat from the legs and thighs of the chicken not only gives a richer flavor, but these cuts are also much cheaper. Make the pastry following the instructions. Heat the oil in a large skillet or deep frying pan. Add the chicken meat and cook for 5 minutes, stirring occasionally until the chicken is browned all over. Using a slotted spoon, remove the chicken and keep to one side. Add the finely sliced leek and the baby button mushrooms. Cook for 3 minutes, stirring occasionally until the leeks are softened. Remove the leeks and mushrooms and keep to one side with the chicken. Add the butter to the pan and melt over medium heat. Add the flour and stir well to incorporate all the flour into the butter. Using a hand whisk, slowly add the hot chicken stock, whisking all the time until a smooth gravy is created, cook for 3 minutes, again stirring from time to time. Add the chicken, leeks, and mushrooms into the gravy, then add the parsley and thyme and season generously with sea salt and black pepper. Cook for a further 2 minutes then put to one side to cool completely. Generously grease two 6 in/15 cm ovenproof pie dishes or 1 x 1 pint dish. Roll the pastry to 1/8 in/3 mm thick and line your dish(es). Re-roll the remaining pastry to make lids to fit the size of the dish you are using. Place the dishes and pastry into the refrigerator for at least 20 minutes. Heat the oven to 400 F/200 C/Gas 6. Place a heavy cookie or baking sheet on the middle shelf. Divide the filling between the two dishes (or pint dish if making just one pie) making sure both have equal amounts of chicken and gravy. Using a pastry brush, dampen the edges of the pastry lining with beaten egg, then cover with the pastry lid and crimp the edges to seal. Brush generously with beaten egg. Using a sharp knife, cut a small hole into the center of the lid to allow the steam to escape during cooking and to prevent pastry from becoming soggy. Set the pie dish(es) onto the heated baking sheet in the oven and bake in the preheated oven for 40 minutes or until the pastry is golden brown and the filling bubbles. Serve hot or leave to cool completely if serving cold.